Chinese authorities have busted a smuggling ring that used drones to whisk $80 million worth of Apple iPhone handsets from Hong Kong to China. It is the first time in the country that drones were discovered to have played a role in a cross-border operation. The drones were used to fly bags, each containing more than ten refurbished iPhone units. Using the cover of darkness, the 26-person ring flew the drones after midnight on "missions" that took only seconds to accomplish. The smugglers were able to fly as many as 15,000 iPhone handsets over the border on a given night. One of the actual drones used in the operation can be seen in the picture at the top of this story. China happens to be the largest manufacturer of drones built for the consumer market, and is looking at ways to regulate their use in the country. 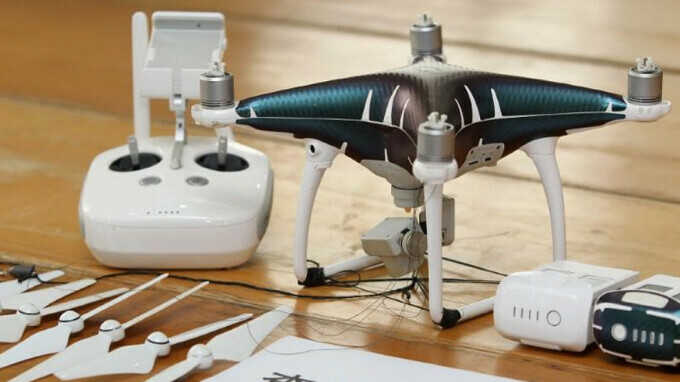 Chinese citizens flying drones up to a certain weight are required to register their craft with the government. Customs officials in Shenzhen said that they are monitoring the use of new high-tech methods that are being used by smugglers in the region. To track down the illegal cross-border shipment of contraband, the authorities in China are ironically turning to drones and high-definition monitors. Smugglers have been sneaking iPhones into China from Hong Kong for some time. Last June, a woman was caught trying to carry 102 iOS powered handsets from Hong Kong to China. The phones were taped to her body, which made her proportions look out of balance. That alerted customs agents who arrested the woman. Back in January 2015, a man taped 94 iPhones to his body and attempted to slip the devices (valued at $49,000) into China from Hong Kong. Like the others, he ended up caught by customs officials. 15,000 phones in a night at 10 phones per flight would work out at 1500 flights per night. That would be roughly 1 flight every 20 seconds for 8 hours. That seems a bit far fetched. And they most probably had tons of drones on the mission. 1500 flights / 26 people ~ 58 flights per person a night they say after midnight so ~ 6 hours 00-06 58 / 6 hours = 9.6 flights per hour which is roughly 6 min 30 sec :). Quite doable. Neither does your story. If you look into it and not just copy the Reuters story you will find that the group used the drones to fly two 200-meter cables between Hong Kong and the mainland. From there, they loaded around 10 iPhones into small bags and sent each across the cable system. So actually no iPhones were smuggled by drones and as i said your story was too far fetched. Your calculations are flawed, who said there’s only one pilot/controller? Nice idea for drug smugglers. Use drones to do the business.